The rear-wheel-drive Cadillac CTS, now in its third and best generation, plays in a prestigious field, including the Jaguar XF, Audi A6, BMW 5 Series, and Mercedes-Benz E-Class. The Cadillac holds its own and then some. From its inception, the Cadillac CTS targeted the German sports sedans, and today it might handle better than any car in that class. New for 2016: revised technology, an 8-speed automatic transmission, an updated V6 engine, and a new CTS-V (reviewed separately). The current-generation CTS was introduced as a 2014 model. The standard engine is a 2.0-liter turbocharged four-cylinder making 268 horsepower, an engine that's nicely tuned but still a bit rougher than the same-size mill from BMW. The engine is big enough, because the base CTS isn't a heavy car, tipping the scales at a neat 3616 pounds. It's mated to a new 8-speed automatic transmission that's in every model except the V8. 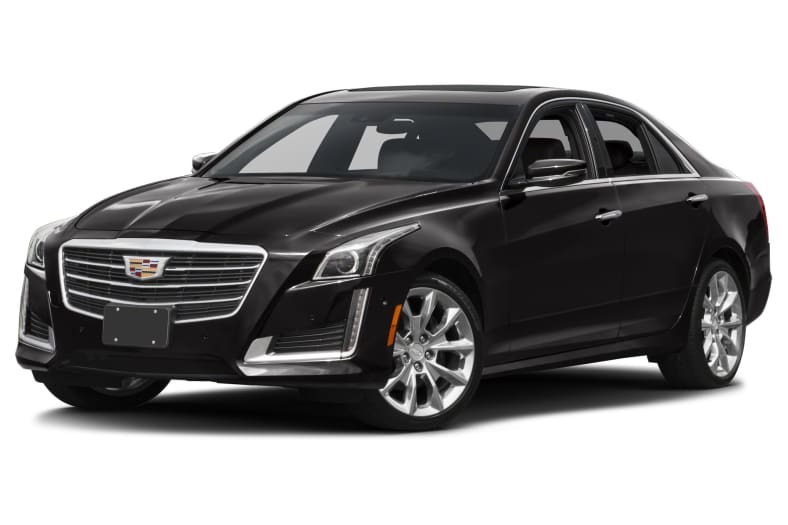 But it's the 3.6-liter V6 that's the bread-and-butter engine, a bigger and better fit for the CTS, especially with available all-wheel drive. The 3.6-liter is updated for 2016 to make 335 horsepower and 285 pound-feet of torque, and can propel the CTS from zero to 60 in less than six seconds. Both V6 engines use stop-start technology to garner EPA approval. There's also a twin turbo version of that V6, called the Vsport, intended to compete with sports sedans like the Audi S6 and Lexus GS F Sport. It makes 420 horsepower and 430 pound-feet torque, uses rear-wheel drive (no AWD available), with paddle shifters for the 8-speed transmission. It's fitted with 18-inch Pirelli tires (replacing 17-inch), bigger brakes, and a track mode. Also new for 2016 is the revival of the humongous powerful CTS-V, featuring a supercharged 6.2-liter V8 that makes 640 horsepower. Other changes for 2016 include Apple Car Play, Google Android Auto smartphone integration, and a 360-degree camera system. The CTS scores well in crash tests, and offers 10 airbags, parking sensors, and a rearview camera as standard equipment. There's that new 360-degree camera system, along with available collision alerts, adaptive cruise control, cross-traffic alerts, and lane-departure warnings. Fuel economy for the CTS 2.0-liter is an EPA-estimated 25 miles per gallon Combined city and highway. The 3.6-liter V6 is rated 24 mpg, the twin-turbo V6 at 19 mpg, and the supercharged 6.2-liter V8 gets a 14 mpg rating.